Set in an impressive white painted lodge and taking its name from the world's second highest mountain, K2 Balti House is located close to the River Bulbourne between the centre of Hemel Hempstead and Apsley. The interior has a modern décor, tables are smartly laid with crisp white linen and there's also a lovely glass conservatory overlooking the pretty landscaped garden and river. The kitchen uses the finest herbs and spices and fresh market ingredients for its menu that showcases Kashmiri cuisine, using modern culinary techniques alongside traditional processes. Apart from the more familiar dishes there are specialties in the shape of gallaniha xacuttie, a Goan style chicken supreme roulade in xacutti curry sauce with cinnamon and cardamom or meen moilee, sea bass poached in coconut and turmeric, served with coconut rice. There's an excellent wine list to complement the food and service is attentive and professional. 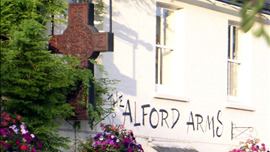 The original of a group of two enterprising Home Counties' gastro pubs, the Alford Arms is set in the tiny hamlet of Frithsden, surrounded by Ashridge National Trust Estate.